This lack of quality at the lower end was, in my opinion at least partly responsible for the sizeable minority of UK consumers who nowadays claim to avoid and dislike all French wine. Wonderfully I think we might have started to put all that behind us. I have noticed a distinct improvement in generic French wines of late. Generic wines by the way are the most basic versions of classic wines, whose labels simply state they are a Bordeaux, Bourgogne or St Émilion with no more specific detail of their provenance. Recently for example, two great value examples of generic classics have brought a smile to my face; Sainsbury’s Taste the Difference 2010 Petit Chablis and Spar’s 2009 Sancerre Chene St Louis are the sort of wines that I have long avoided, but no longer will. They both have concentration and are good quality and great value examples of what Chablis and Sancerre are all about. There will not be one single reason for this. All sorts of things are potentially responsible for these signs of improvement, but viticulture has improved beyond recognition all around the world in the last 20 years or so. This has resulted in better ripeness levels and wines with more concentration. Add to that greater understanding and attention to the market, as well as winemaking techniques and technology. Also, most French wine makers nowadays are fully trained, even those in the back of beyond. Sounds simple, doesn’t it, but it wasn’t so long ago that most winemakers in France just did what their forefathers had done, now they understand the science and the technology behind what they do just as much as a wine maker in Barossa or Napa. All this has been running around in my head for a while, but was brought into stark focus during a recent visit to Bordeaux. I was the guest of Yvon Mau and was taken to a wonderful range of Châteaux that brought my love of good Bordeaux wine bubbling back up to the surface. It was a lovely visit and I think that with a recent run of fabulous vintages it was a good time to rekindle my feelings for this extraordinary region and its wines. We can never underestimate Bordeaux. It is the largest fine wine region on earth and home to a staggering number of the world’s finest and most sought after wines. 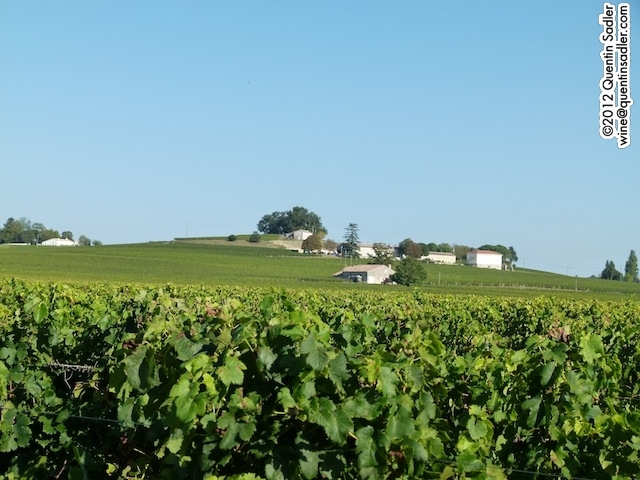 It is also the rôle model really for all the fine wine in the world, Napa, Coonawarra, Maipo and Stellenbosch all doff their proverbial cap at Bordeaux – even if they are unaware of it. On every wine trip there is a point where one’s energy levels drop and enthusiasm for the job in hand slips. On this trip it was on the last day and we had a marvellous visit to Château du Val d’Or which is a Saint Émilion Grand Cru whose 2009 had lovely weight, fruit and concentration. I have long been slightly wary of Saint Émilion Grand Crus as they seem to promise much and can be very expensive, yet often disappoint. This did not, it was a lovely wine and sells at a pretty reasonable price by modern standards. Even better we had it with a proper grape picker’s lunch. The romance of wine welled up inside me and made me realise what it was that I loved about wine all over again. 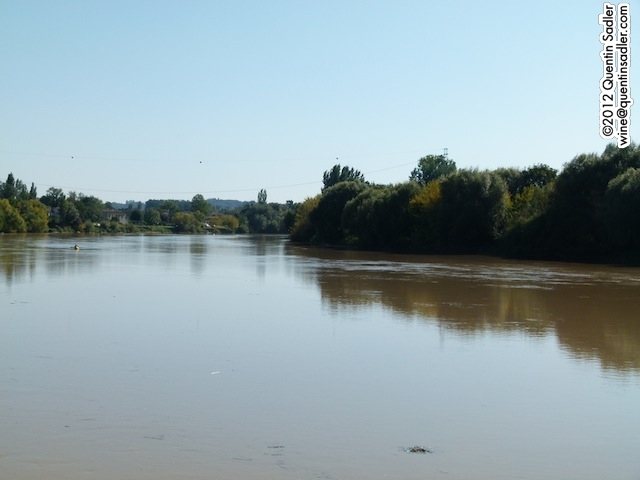 The property is right on the banks of the Dordogne, which added to the romance and they were doing lots of interesting things with technology and yeast. I really enjoyed it and was excited like a kid on a school trip, what’s more the lunch had been excellent and at some point I seemed to have stopped spitting and started drinking. So to be honest I was not massively enthusiastic about heading off to somewhere that sounded dull by comparison – and I really wanted a little snooze. Regardless of my lazy relaxed thoughts we were soon on our way to a St Émilion satellite, despite the fact that I wasn’t in the mood and that I wasn’t expecting to find it exciting. Which just goes to show how wrong I can be, because I loved it and the wines were great. A St Émilion satellite is simply one of the villages or areas that surrounds the St Émilion appellation and produces a wine similar in style and are allowed to add St Émilion to their village name on the label. They are Lussac-Saint-Émilion, Montagne-Saint-Émilion, Puisseguin-Saint-Émilion and Saint-Georges-Saint-Émilion and they are widely believed to be of lesser quality and generally command a lower price than St Émilion proper – let alone Saint Émilion Grand Cru. In the past many of these wines stocked by UK stores have been seen purely as cheaper alternatives to St Émilion proper and I often felt the name on the label was more important to them than the wine in the bottle, so I have tended to avoid them. There are exceptions, of course, some producers in these satellites have always focussed on quality and enjoy high reputations – Château St Georges of Saint-Georges-Saint-Émilion springs to mind. The countryside was beautiful and captivating and we kept passing Châteaux with famous names and price tags to match before we finally pulled up at a…well a warehouse really. A warehouse in an attractive location, but warehouse none the less – not all the Châteaux look the part you know! This warehouse of course is a working winery and the centre of operations for Chateau Guadet Plaisance and while there is nothing glamorous about the building, the setting is glorious. All around the vista was beautiful and peaceful and I felt myself becoming interested. Then our host emerged and proceeded to bring this landscape to life. His name is Pierre Taïx and he is the owner of a handful of properties, but as he spoke this one seemed very dear to his heart. This peaceful spot has had quite a history. Pierre took it over in 2008, but it was owned by the Gaudet family for nigh on 200 years and they are very famous around here. Jean Marguerite Élie Guadet was an important figure of the early revolutionary period whose lack of desire to see the King removed led to his own appointment with the guillotine. Despite this his descendants seemed to thrive though, with Julien Gaudet becoming a long-serving mayor of St Émilion and the family owning many wine Châteaux in the area. The estate is almost all in a single block that covers a plateau of nearly 10 hectares and comprises 50% Merlot, 30% Cabernet Franc and 20% Cabernet Sauvignon growing on well drained clay, limestone and sandy soils. Pierre thinks this soil works well for ripeness – the sand counterbalances the cooler clay soil and that helps ripeness in the grapes, however it is easily compacted so everything here is done by hand, they grow grass between the rows too and use biodynamic methods and are now certified organic. This is pretty rare in Bordeaux as it is hard to do in this land of large vineyards, however on an estate of this size it is perfectly feasible. 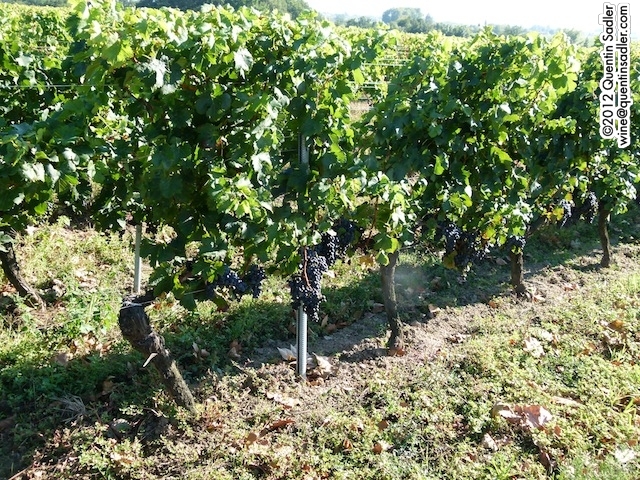 Pierre is certain that all this gives his vines deeper roots that results in smaller yields and berries, greater concentration and better quality than if he used the more general methods. 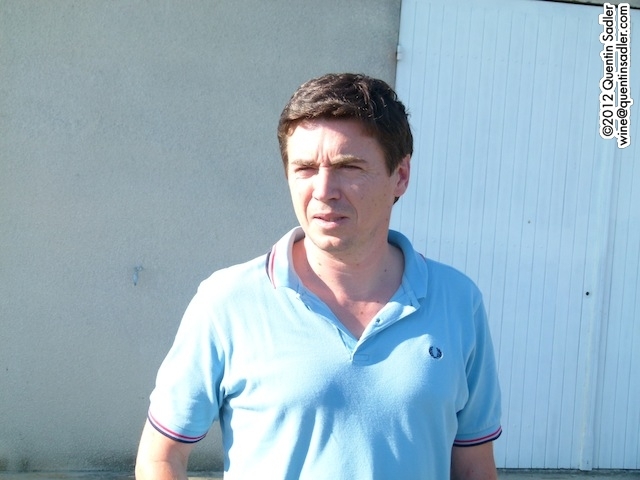 I certainly got the impression that Pierre is aiming high here, he believes in Chateau Guadet Plaisance, its terroir and potential for quality. Pierre seeks to create a terroir driven wine that still offers good fruit with ripeness and succulence and no vegetal character – which he feels to be a fault. He also regards over ripeness as a fault and seeks balanced ripeness in his wines. So far only the 2009 and 2010 have been made since he has owned the estate, but I really did feel that all this care and attention to detail showed in the wines. For me the 2009 had the edge, but the 2010 was also very good, a fraction richer even, which will appeal to many people. I had tasted finer wines on the trip and will write about some of them soon, but I did not taste anything that surprised me more or challenged my preconceptions more and so this wine pleased me more than the others. In the past I would have ignored this wine when I came across it on wine merchant’s shelves. I now know that it punches well above its weight and feels much finer than you would expect and while not dirt cheap it is very affordable for what it is and gives a real glimpse of what fine wine wine is like while offering great value for money. Available in the UK for around £14 a bottle from Soho Wine Supply and The Oxford Wine Company. 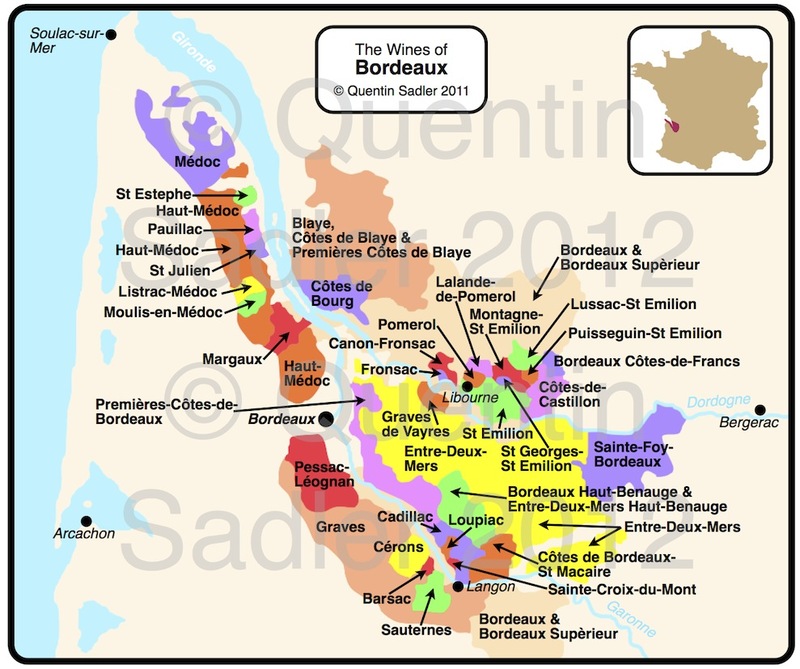 I have a very different view of the “lesser” names from the great French wine regions. 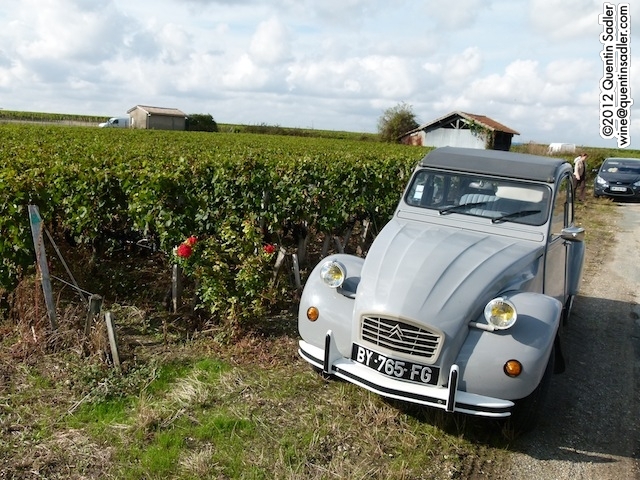 Quite in contrary to the historic picture you paint in the beginning of your article in my view many of the “famous” French wine regions have offered excellent value for money in particular at the lower (or perhaps mid-range) price end. You could (and still can) find outstanding examples of Burgundy, Chablis, Bordeaux etc priced between 5-15-20 euro. As long as you stay away from some of the well known and internationally distributed brands. In fact, those wines often offer much better “quality for the money” than many new world wine do. But the difficulty is just that: these producers are often small and have little international marketing clout. They have great difficulties selling to Sainsbury, Tesco, etc, or Systembolaget for that matter. And it takes some knowledge (or luck) by the consumer to find them. 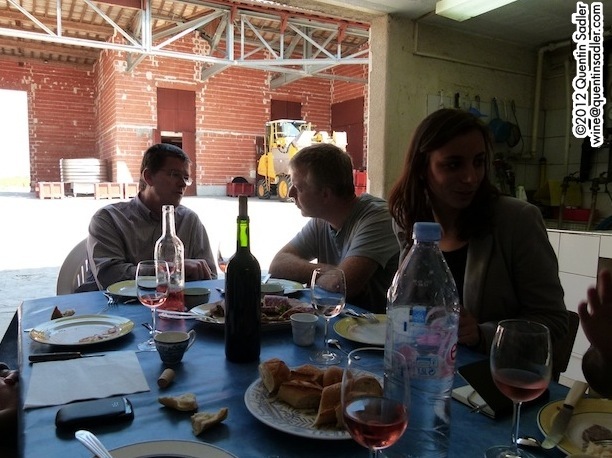 It has been, and is, a structural problem with the French wine industry. Many good value producers are very small. And conversely, it is often at the top of the range that you have the least interesting value for money proposition. Anyway, glad you discovered some petits chateaux to you liking. There are some 8000 of them! Great to have a different view! Perhaps I should have explained that this is a view about the UK, especially about what is available to the ordinary consumer, not the wine enthusiast who seeks out wines. In my opinion until very recently most ordinary and cheapish Chablis on UK supermarket shelves bore little relation to the traditional style of Chablis – other than being dry and crisp. They were green and tart. The same was normally true of Sancerre et al up to about £10-£12 a bottle. Similar things could be said for all the famous classics; Châteauneuf at around £10 was, probably still is, tedious beyond belief – and yet the consumer still thinks of it as a treat. The same can be said of the cheaper on trade versions too I am afraid, dilute and unexciting wines sold as though they are something special. Remember that 85% of wine sold in the UK is under £5 – so the great majority of people have never tasted a £10 bottle and never will! £10 for most people is an expensive wine, a very expensive wine and yet it gets the cheapest possible examples of these wines. I have long assumed that it was about getting the famous name on the supermarket shelf as cheaply as possible – because they sell. Clarets at this sort of price point in the UK have long been dry, dusty, green, vegetal and dilute, so give no idea of what can be had. New World wines on the other hand at least gave the consumer fruit. And you must remember that the UK palate generally likes fruit more than the French one does! However, it seems to me that this might be changing – hence the piece. I do agree with you about the New World thing, the prices have crept up and nowadays there is great value from France, but until recently I would say that in the UK it is not from cheaper famous classics, but lesser known wines, but most consumers stick to a very narrow range of wines that they have heard of – and so get or at least used to get bad value. Perhaps it is different in Europe? I admire your blog so much and hope to have one like it some day. I also love the sleek nature of the bottle you photographed above. I recently wrote my own post about a series of wine bottle designed around the Seven Deadly Sins. If you would like to take a peek, perhaps follow or just leave a comment on this post, I would greatly appreciate it. I am just starting out and you are already so influential!